1. Capturing attention. You’ve spotted it! Just like you spot a cute guy or girl in a coffee shop, or that paperback you’ve always wanted to read in a used-book store, you’ve spotted the perfect yarn or the perfect pattern. You touch and look, then walk around and check out the competition, only to frantically rush back when you see another knitter fondling what, really, is meant to be yours. The glee in your heart as you stand in the checkout line, or finally receive the order you placed online, plants a huge grin on your face, even if you save it until you’re alone in your apartment. 2. Courtship. It’s yours, all yours! You get it home, place it on the coffee table, and admire it from different angles. But not for too long – as soon as all the essential components are there (yarn, pattern, needles), you cast on. Ahh! You know what I’m talking about, that first row you knit with a new yarn, it’s better than… many things :). You are still trying to establish the rules of the relationship with your yarn – how tightly does it like to be knit? What kind of needles work best with its texture? Everything is new and exciting! 3. Early love. You can’t wait to knit! If you aren’t working on your project, you are thinking about it. You can’t wait to keep knitting and seeing the item develop in front of your eyes. At the movies, at dinner, while you dream, all you can think about is that tricky border and that lovely texture. Your SO is afraid you’re seeing someone else named ‘Pearl,’ because you say his name in your sleep. Life is gooood. 4. Monotony. You’ve figured it out. Now there’s nothing new. Yes, this is exactly how it looked two rows ago, two days ago. Yes, you already know that after the green section of the yarn, the gray will come. Is there really a back to this thing, too? You look ahead at the pages of the pattern and can’t believe that one measly sweater has four parts… and there’s a collar, too? This is getting ridiculous. You contemplate making a placemat out of the intended scarf, a vest out of the sweater. You start hiding the project in non-transparent bags in hopes of forgetting it. 5. Cheating. You’ve had enough. Yeah, yeah, you loved it once, but the front took four weeks, and you’re skilled at proportions, and adjusting for your serious lack of motivation you’ve calculated that the sweater will be done in… August?!? A wool sweater in the middle of summer? You roll your eyes. You’re ready to feel something new on your needles, so in secret you surf the web for new project ideas and stop by your local yarn shop. You come home with a plastic bag and your project shoots you an angry glance. What? Oh that? It’s nothing, just some stitch markers, hehe. There’s no way you could start a new project while your unfinished one is looking at you, so back in the non-transparent bag it goes! The feel of new yarn and new needles is making you woozy. This is what’s knitting is all about. Yes, you weren’t intending to make cotton socks in the middle of winter, and, yes, you grabbed the first yarn which slyly winked at you at the yarn shop, but damn it, you needed a change! Isn’t that a good enough reason?!? Shut up, brain. You need cotton socks. Now. In lawn green, thank you very much. 6. Reconciliation. You come running back. While cleaning the back of your closet, you come across a non-transparent bag and open it up against your better judgment. Ahh, that’s what it is. Instead of being repulsed, you touch the fabric and suddenly remember why you started the project in the first place. Wow, the yarn is spectacular, and the color goes so much better with your skin tone than that hideous lawn green. And the design is so clever, that tricky border really makes the edges so interesting! You cautiously knit a few rows to see if your hands remember how to handle the yarn and pattern, then jump into it head first. The next thing you know, you’ve finished a sleeve in one evening. You are on your way to being soul mates once again. 7. Nagging. Just… one… more… row! After your reconciliation, you knit like crazy. You don’t stop to think and admire your work, you just knit until your wrists go numb. Your friends haven’t seen you in a few weeks, but that’s okay because you’ve just got a few more inches to work. But exactly when it’s almost over, it seems your needles have been paralyzed. The project just sits there, laughing at you. You force yourself to knit the same way you forced yourself to have that “bubble gum” flavored medicine as a kid. And nothing works. All of a sudden you can’t remember the simplest of decreases and your seaming would allow passersby to discern the color of your lingerie. Utter frustration at the most inappropriate time. It’s a battle between your brain telling you, “do it!” and your hands saying, “whateva!” You’ve included “ability to seam” in your prayers, never mind that it’s the only thing in your prayers, you have never before prayed in your life, and that you’ve been a conscious atheist for the past 15 years. 8. Closure. You place the finishing touches. You already had the psychiatrist appointment scheduled, but somehow things have resolved themselves before you reached full-blown insanity. Seaming wasn’t so bad after a few shots of vodka, and you decided that a turtleneck wasn’t your style anyway, thus reducing your finishing work to a simple crewneck collar. You’re glad that you added an extra inch to the length, and your perfect choice of style, color, and yarn even amazes yourself. Where are you right now in your knitting relationship? Me and my alpaca lace scarf are around stage 6 or 7. Which means we’ll be admiring each other sometime soon :). The pattern is called Vintage Pink Cardigan, and it’s knit in light worsted/DK alpaca/silk blend. Here’s the thing: I know I’d have to modify the pattern right off the bat. Cardigans never fit me because they come apart at the bust, so I’d either have to make extra increases or make short row darts or something. I would also consider making the sweater as is, and sewing the opening shut. This is what I do for all the blouses I own. What makes me even more doubtful is that this sweater, more or less, has an intricate design running vertically down the middle. I do not own any sweaters which are designed this way, so I have no idea whether this style would go to me. I know, I know, I should get myself to Macy’s and try something like this on, then decide whether this project is worthwhile. And it’s not like I don’t have plenty of other works in mind! Other than swatching for the KnitPicks review, I have not knit one row this entire week. I’ve been busy with work-related stuff, sigh. I got this out-of-print hardback edition on eBay, and it’s in great condition. The dust jacket is a little worn and the pages are a bit yellowed from age, but it looks untouched otherwise. I paid $38, including shipping. This is a little more than what I paid for the first and second editions, but … I wanted it! If you were the one bidding against me just seconds before the auction’s end, I’m sorry. I did outbid you. I eBay a lot, and I know how to make sure I get the item if someone is also bidding at the last moment. I take it back. I’m not sorry, I’m gleeful :-D. Now I got the first, second, and third out-of-print hardback editions of Barbara Walker’s Knitting Treasuries. Woohoo! I love the Clapotis. I have not made a Clapotis, but the design is SPECTACULAR. I’m a difficult person to please, and I don’t dole out adjectives like ‘spectacular’ often. Kate Gilbert, are you reading this? You are brilliant for designing the Clapotis. However, everyone and their mother is knitting a Clapotis. In particular, Betsy is making a gorgeous one. And everyone else is making one. And I’m sick and tired or reading about it… the Clap, Clapotwo, Clapothree, blah blah blah. I’m taking a stand. I will knit something more original. I will not look like everyone else. I am my own boss! (insert Eric Cartman voice) I do wha’ I want! I feel what I feel when I think about Fun Fur. This is very sad, because the Clapotis is… spectacular. Sigh. I feel that the post where I talk about my new project, the Adrienne Vittadini sweater, needs a follow-up, since I’ve found a yarn to make it – woohoo! The suggested Adrienne Vittadini yarn is completely out of my budget. I considered your suggestions, and surfed the web here, there, and everywhere, and here’s what I was thinking. First, I very much like Karabella Aurora 8. This is a yarn I’ve seen at the LYS and have had the chance to touch. Very soft, plush, and some of the colors are right up my alley (#2, #5, #20… some others not carried at WEBS). However, it’s still a bit too expensive and recently I ran into someone wearing a scarf made of it. Very interesting coincidence: the pattern for the scarf I’m currently knitting (halfway done, by the way) is written for Karabella Aurora 8. Anyway, I ran into a woman wearing it made from the suggested Karabella yarn and it looked completely deflated. Like a cotton sweater worn to death. No thank you! This one is out. The second yarn I spotted for the aforementioned AV sweater is KnitPicks Andean Silk. The gauge is right on, and the content is incredibly similar to the suggested yarn called Martina. The color I would use is called ‘sangria’, a wine red that’s not bad at all*. 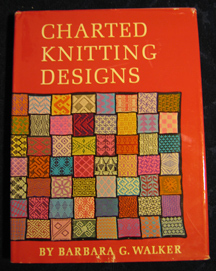 However, from my KnitPicks review below, I wasn’t so crazy about the yarn. In contrast, KnitPicks Merino Style and Elegance yarns impressed me very much. With respect to Merino Style, ‘hollyberry’ and ‘storm’ colors went really well with my skin. As for Elegance, I really liked ‘ash.’ But to be honest, I really liked the Merino Style, and probably wouldn’t go for Elegance at all. The gauge of both Merino Style and Elegance is different from what’s recommended (recommended is 19 sts/4 inches, and these yarns are 22 sts/4 inches). However, considering I’m going to have to rework the entire pattern anyway, why not squeeze in a gauge change while we’re at it?!? I don’t even know why I buy patterns any more, I rework all the important details anyway. So, at this point I’m pretty much poised to buy the Merino Style in ‘hollyberry’ for my sweater, and I will, pending one other thing: I might be going to WEBS in a few weeks. A knitting friend has invited me to go, and who knows what goodies I’ll find there. If the goods are good, they will be bought**. I just hope they take credit cards, otherwise I’ll have to stuff my pockets with wads of twenties and it won’t be a pretty site :). *For all these different yarns, I stand in front of the mirror and put the skein next to my face – that’s how I decide whether the color will go with my skin tone or not. I’m very pale with a bluish tint (really), so many yarns just blend with my skin. **Someone got her tax return and wants to strangle her accountant for way overestimating how much estimated tax she had to pay last year. But that’s okay, because now I got it all back.